You are here: Home / Search for "M&P 2.0"
Smith & Wesson M&P 2.0 Arrives! The Smith & Wesson M&P 2.0 is a fantastic pistol. Smith & Wesson was a very popular location at the Industry Day at the Range this year as they unveiled their new M&P 2.0 pistols. The M&P 2.0 pistols have several enhanced features designed to improve the shooter’s ability to manipulate and shoot the pistols. 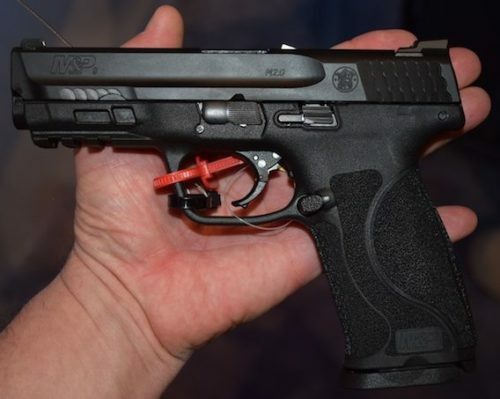 The M&P line has experienced a very good response since its return in 2005, but it has not been without some setbacks. The initial trigger had some creep issues from a long trigger pull leading up to a heightened break pressure. It was not long before S&W went back in and strengthened the trigger spring. In addition, the grip texture was not favored by many. Though the grip angle and overall feel received high praise, the texture left something wanting. The M&P 2.0 has fixed both complaints with an enhanced trigger, and aggressive but comfortable grip texture for outstanding control. The Los Angeles County Sheriff’s Department employs nearly 10,000 deputies. In December, 2015 the Los Angeles County Sheriff’s Department released a LA County Inspector General report on the department’s new Smith & Wesson M&P pistols. The report indicated that the new 9mm pistols were prone to accidental (negligent) discharges that endangered the Deputies and the community alike. In addition, the report identified a breakdown in the selection process, inadequate training during transition, and improper training on new pistol mounted lights. In essence, the M&P pistols are unsafe! Smith & Wesson M&P pistols have been making very respectable gains against the large majority claim that Glock has held on American law enforcement handguns, this news is more than a little troubling. My experiences with M&P pistols have found them to be very reliable, and accurate pistols, and the grip design is one of the most ergonomically sound and comfortable grips on the market, in my opinion.